One amazing situation/question passed on by our audience at SFU’s Backpack to Briefcase Conference last Saturday: In this competitive labour market, where everyone is so driven, so talented, so educated, and so willing to show s/he has the skills and passion to do the job, how do we, as candidates, distinguish ourselves, how do we find that unique side we all supposedly have? Theodore Roosevelt’s words, “Believe you can, and you’re halfway there” stand strong when I think about this. We would all benefit from each others’ thoughts on this topic, so I consider the front open to answers and comments. As far as I’m concerned, there are not two people alike, not even after a so called “superficial” 5 minutes conversation. We’re usually not doing a good enough job at getting to know ourselves, and that doesn’t stop at youth or digital gen, but applies to all of us, thus we need help from others (anyone who can be completely honest will do) and we need to access/use available personality tests, such as MBTI, Personality Dimensions etc., to run a comprehensive research on ourselves. We need to start with understanding ourselves, this comes first. When we have a chance to talk to prospective employers at an event, they will see certain traits in us right away (surveys say it’s a game of seconds). We need to be able to help them see the rest of our abilities and soft skills, and we need to be able to convey that in a certain way, we need to become good at displaying it. Not that we should fake it, but do you recall any memories of imagining yourself at this event or party, walking elegant, talking with confidence, smiling, and all that in only a few seconds of keeping your eyes closed? Yeah, that kind of day dreaming. Then reality kicks in, and at the same event we have just imagined ourselves shining, we stumble in things, or people, or just mumble what was supposed to be a glorious speech. When we look back, we think “gosh, I should’ve said that!” Something’s missing, eh? Yes, you’ve got it, it’s called practice. A gold medal doesn’t come without hard work and lots of perspiration, so imagine the job you dream of is your gold medal. Fight for it. Think about your story. Have it ready. Say it with confidence. One of the students told me he kept a job along to pay for his own studies and I could see the sparkle in his eyes, he was proud of what he has achieved. I liked that. So use your story, make it beautiful, tell your friends about it, become a natural at taking about it. A short and compelling story, told from your heart. That is what will differentiate you from others. People remember stories, and while not all of us can be a good story teller – here’s the good news – most of us have improved by working at it. Once you became good at it – you may add this to your soft skills set. 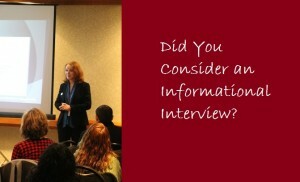 Did You Consider an Informational Interview? Well, most of those I have asked, would say something like “I’ve never heard of it. What is an Informational Interview?” An Informational Interview is a business meeting between two professionals, with the purpose of learning more about an occupation, a specific role, or a company. What makes this interview uniquely useful is the nature of the information you gather. Not only will this be specific to a certain geographic area, but it will also speak to a particular life experience. This type of meeting can be arranged by a third person (by referral) or directly between two professionals: one seeking information and the other willing to help and provide it. The informational interview is usually very short and the purpose of the meeting has to be clearly outlined to your interviewee from the very beginning. For example, if you are an internationally trained engineer, you may want to conduct at least 15 informational interviews with professionals working in the same filed, but in your new country/ location. There are so many things, besides the licensing process, that you may find rather different and your path needs to start with understanding these differences. An Informational Interview helps less experienced professionals, such as new graduates, to have their questions answered by someone who is seasoned and has at least 5 years of experience in a certain position/ filed. This is a exceptional way to exchange ideas and learn directly from the source. How can you schedule such an interview? By all means, there are very strict rules to go about it, especially if you want to succeed. To begin with, you need to conduct extensive research to identify your target organizations/ professionals and learn more about them. Carefully analyze your intentions. You’re mistaken if you think that an informational interview is a job search activity, don’t set yourself for failure. 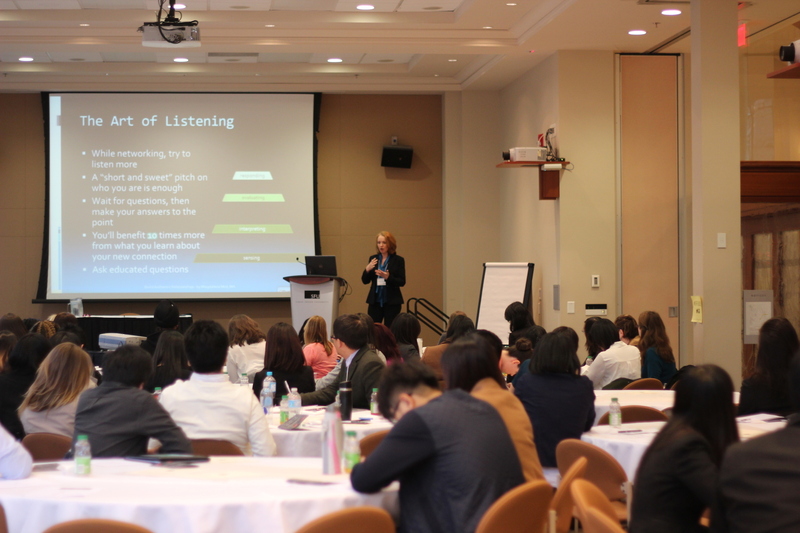 These meetings are meant to help you create a professional network, build relationships, and expand your understanding while shaping your own path success. Therefore, to schedule an appointment, you may contact the selected interviewee by telephone or someone may introduce you. When calling, it is preferable to try a few times before leaving a voice message, especially if you did not have a chance to meet this person before. LinkedIn direct messages or email may be other options for the first contact, but most would prefer a phone call. What are the steps? You need to know how to introduce yourself (remember that elevator pitch you practiced?) and have outlined a clear way of presenting the purpose of your request. Be flexible and set the time of the meeting around the schedule of the professional you’re going to interview. Make sure to specify that this would be a very short meeting, 15 to 20 minutes, and can be easily done during a coffee break. The preferred location would be at the workplace of the interviewed professional, as this will help you learn even more about the workplace, but if this is not possible, a coffee shop or cafeteria nearby may work as well. Sometimes people agree to be interviewed over the phone and you may conduct your interview this way, but most don’t find it as effective as a face-to-face and I don’t really recommend it, unless you have no other choice. You’ve been successful in setting up the meeting. What’s next? Research, of course. Based on information about that specific organization you can easily reach, you will need to come up with 12 to 14 questions to be asked during the Informational Interview. To ensure efficiency, have them ready or even print them off. This meeting has to stay short and respect the time frames agreed upon beforehand. Please note that time is a very sensitive matter and you risk to make a poor impression and ruin everything ion case you will not abide by the agreed schedule. The questions you can ask may vary from position specific to organization/ workplace specific, feel free to look at other resources available on this topic or talk to a career advisor if accessible. What do you gain? You will leave with invaluable information about your targeted occupation and, most likely, about that employer/ organization. How will you organize and use this information it’s totally up to you, but if well organized, your informational interviews will help you tremendously in the long run: at a certain point in the future you may interview with that organization and, as a job candidate, you will have inside information and the advantage of knowing firsthand what other candidates may not know. Moreover, you will be able to keep in touch with people in your field and expand your connections. Keep in mind that building trust takes time, created relationships will not become your trusted network overnight. Set realistic long-term goals and follow your strategic career development plan step by step. My grandma use to say – big things don’t happen overnight, there is always an incubation time, so be patient. Why bother? You’d ask me now why spend so much time and energy planning and conducting these informational interviews? And you are right, they do take lots of time. Yet this is easy to explain, as we all know that good things don’t come easy. I also have a great quote that speaks for all it’s been already said: If I had 8 hours to chop down a tree, I’d spend 6 sharpening the axe (Abraham Lincoln). If it happens you are new to B.C., trying to find a position that matches your personality and skills, consider that this may take lots of preparation. Here is something that never ceases to amaze me: the power we find in others’ eagerness to get things done. No matter what. I know many people who are so beautiful just because they never give up. They have a plan to follow. They have another test to pass. They have another step to take. It’s a constant battle we fight with life. Sometimes we think it’s a game, a game where we try to win, only that participation is not optional. I believe it was Shakespeare who said it, wasn’t it? Life is a battlefield, therefore you need to fight to earn the privilege of living it. 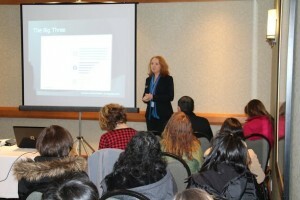 I had the opportunity to speak at SFU this past Saturday. To a large group of new Canadians, and some of them not so new anymore. Their questions, their willingness, their keenness stayed with me for hours. I felt energized and empowered by these people’s humble desire to regain their lost professional identity. Even if the ability to help is little, it felt good to be there to listen, to try to understand, and to leave the venue thinking of possible new solutions. Of what could be implemented. Of how can we become a better home for them. Of how could we use this tremendous array of skills they bring to their new home. Possibilities. They will never fit in a box. Even if there is much that has been done, there also is so much room for improvement. It takes time and hard work to get to the front lines, nothing new here. If you are one of the unemployed or underemployed new immigrants to British Columbia, you’re probably trying to be out there and sell your skills in this wild job market. More often than not, candidates start promoting themselves with listing their degrees, presenting their technical skills, and talking about their extended experience in a specific field or industry. But is this what employers are seeking at a first glance? When asked, interview candidates are not sure. Most of them are just starting fresh in Canada. Ultimately, it is a different culture and people here may evaluate and assess all those skills at a different scale. Employers have confessed that they are looking first at something that candidates may not consider very important and even exclude from their list of priorities. And what would that first aspect be? Hiring managers love to assess it: it’s your attitude. Hence this may be the right time to ask yourself if you have the right attitude when approaching this workplace culture. It is sometimes difficult to guess what the right attitude would mean in different situations. This requires a candidate to run a thorough research and be quite knowledgeable about the organization they are applying with. Every organization/ company will have different hiring selection methods based on their values and plans for future growth. Some people are just lucky to obtain a successful position by being themselves… if they happen to be at the right interview, with the right organization, at the right time, with the right people. I will have to agree that there are way too many variables in the above sentence and in 99% of the real life scenarios this actually comes down to hard work. An employer will be able to identify if you are a low performer looking at characteristics you may not even consider when you prepare for your interview. Someone with great skills and poor attitude may be as well labeled as a ‘talented terror’ and not as a good candidate. Someone may be assessed as a high-performer or as a low performer by looking at their choice of words in their answers or by looking at the pitch of their voice. For example, interview answers of a high performer will contain 60% more first person pronouns (I, me, we), while those of a low performer will contain 90% more third person pronouns (he, she, they). Check out Mark Murphy’s book for a fun ride on learning about the right hiring attitude. While the book is aimed at hiring managers, I found it fascinating for someone who wants to have a better grasp of the hiring and workplace culture in general. Good luck in your next Canadian job interview!